You can easily and quickly create error-free 3D printable files from a medical CT scan using the democratiz3D service from embodi3D®. Below you will find a quick step-by-step guide on how to upload your file for processing and then download it for 3D printing. Visit our User Manual and tutorials for in-depth topics and our FAQs for answers to the most common questions. Step 1: Log in to your embodi3D account and launch democratiz3D. If you haven't already registered for an account, sign up now. It's quick and free. Then go to the democratiz3D menu and select "Launch App". Step 2: Upload your NRRD file to be processed. NRRD is a file format that allows transfer of imaging studies stripped of personal information. NRRD files contain no patient information and are thus a safe way to send image data without compromising patient privacy. Embodi3D does not accept files that contain patient information. To learn how to create an anonymized NRRD file from a CT scan, see the tutorial here. Step 3: Enter file information and select privacy settings. These fields are particularly important if you will process multiple files or if you share your file with the embodi3D community. This information will help both you and others find relevant files. Select whether you want to keep your file private or share it with the embodi3D community. We encourage you to share your file, making it available for download to other embodi3D members either for free or as a file for sale in our marketplace. If you share your file, select the appropriate license. More information is available in the User Manual. Step 4: Select processing parameters and processed file options. Select the Operation and leave the Threshold at the default value unless you are familiar with this parameter. Choose a file output quality. Higher quality includes more polygons and thus more detail but results in a larger file that takes longer to process. See the User Manual for more information on these options. The Type, Privacy and License options are the same as in Step 3 above but here they apply to the output file. You will note that certain Operations and Ultra Quality are marked "premium". These may require a payment to download your file. Read more here. You will then see a notification informing you of the estimated processing time. Step 6: Wait for file processing to complete and access your processed file. Processing time varies greatly depending on file size and quality level selected - anywhere from a few minutes to an hour. Thumbnails of the processed file will be added a few minutes after file processing is complete. Once your STL file has been generated, you will receive an email with a link to your file. You can also access the file via the website: click on your profile and select My Files to see a list of files that belong to you. Both the source files that you uploaded and the processed files are shown here. Once you have opened your model download page, you can inspect the automatically generated thumbnails. If you are happy, you can download the file by clicking on the download button. If you are not satisfied with the result, you can resubmit your NRRD file for processing using different parameters (see our User Manual). You may also want to double check that your scan quality is sufficient for 3D printing. Review and accept the various legal agreements to proceed. If you are a regular member and generated your STL file using a Premium operation or quality level, there will be 2 steps before you can download your file. Those steps are shown below. If you are a regular member, you will also see a message alerting you that payment may be required to download your file. We offer both a Premium Membership and a Pay or Share program to give everyone access to the Premium services - if you share your processed file with the embodi3D community, all Premium Services are free. 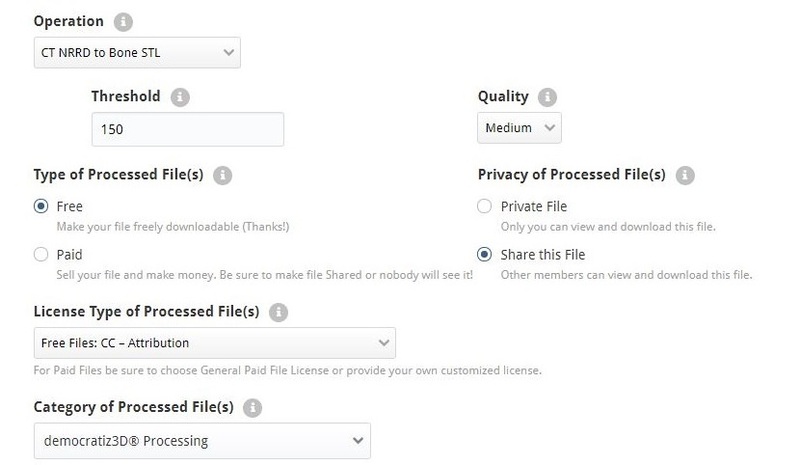 If you use Premium Services to process your file and wish to keep your processed file private, you have various payment options to download your file: you can pay a one-time fee to download your file, or you can become a Premium Member with a monthly or annual subscription. Premium Members have unlimited access to Premium Services and have full control over their files, including downloading, editing, and marking them private. You can view the thumbnails of your processed file for free before deciding whether to download it. Premium subscribers have full control over the files they generate with premium features, and can download freely without being shown the choices below. 1) There will be an alert above your thumbnails. 2 ) When you click "unlock", a pop-up with your Pay or Share options appears. Select an option and your file will be unlocked for downloading.